Hide WhatsApp Last Seen Time on iPhone, Android, Blackberry. Hiding the last seen time on iOS is relatively easier than doing the same on Android phone. WhatsApp for iPhone comes with an option which lets you hide your last seen time easily. To do the same time in Android, you either have to install additional apps or play with your device settings. Anyways let’s bring our focus back on iPhone. Upon launching WhatsApp, go to Settings. The only disadvantage is that it takes around 24 hours if not more for your new settings to go live. Fortunately this isn’t the case with Android. And if you ever decide to change your settings again, make sure you can wait for twenty-four more hours! How does this app work? – After you’ve configured the application, the app starts to work. When you open WhatsApp, Not Last Seen app automatically disables your WiFi connection and when you close the WhatsApp window, it automatically starts WiFi. Its accurate and doesn’t keep you waiting. So calling it an automatic WiFi on-off app is justified. Download Not Last Seen app. We don’t have a Google Play Store link since the app no longer exists there. It violated some Google policies they say. Launch the app. 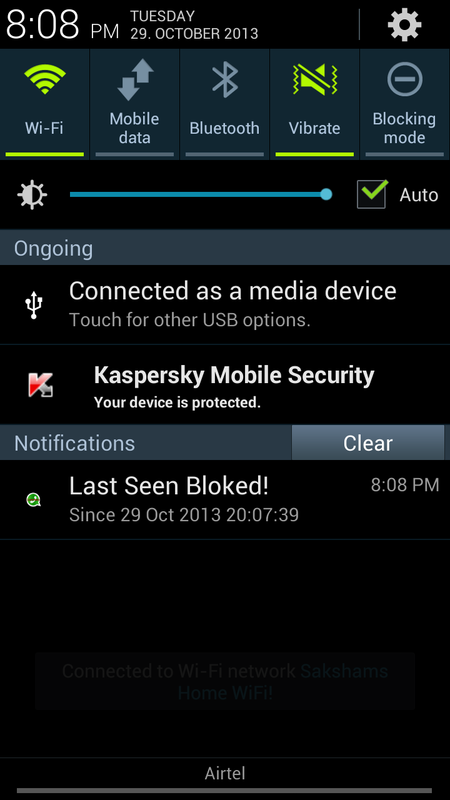 You’ll see three options – Block Last Seen, Block Last Seen at Boot Phone, Always Recover WiFi. Since the app is no longer updated, simply ticking the first one didn’t work for me so I had to tick the second one i.e Block Last Seen at Boot Phone too. If your WiFi connection doesn’t start automatically when you leave the WhatsApp window, tick ‘Always Recover WiFi’. When the app runs you’ll see a message in your notifications area. You can tap it to change the settings if required or leave it as it is or tap clear to hide it from your notifications bar. I however recommend it to stay there so you’re aware your last seen is hidden. The messages will be sent as soon as your phone connect’s to the internet without anybody coming to know the last time you accessed WhatsApp! 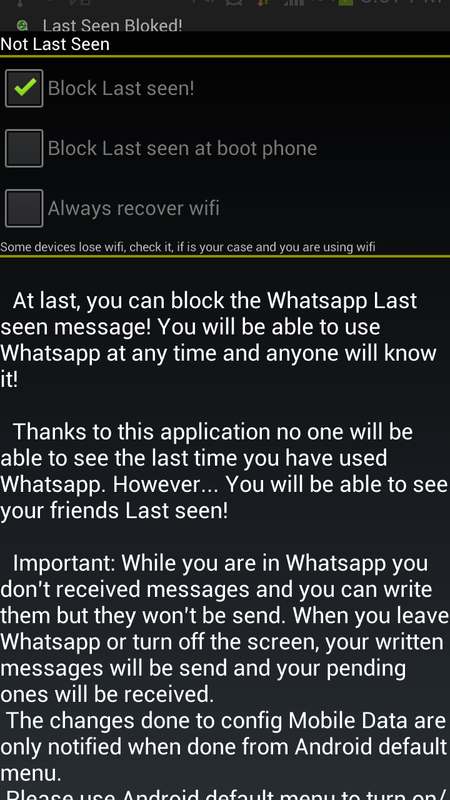 The last seen they’ll see will be the time you last opened WhatsApp with your internet connection on. This update still hasn’t made way to the Google Play Store. So you need to download WhatsApp from whatsapp.com/download and then follow the steps below. To hide your last seen simply go to Settings -> Accounts – Privacy and change the options accordingly. You can change settings for your last seen timestamp, your profile picture and your status individually. For example you can hide your profile picture but keep your status visible or you can hide your profile picture but keep your last seen at time visible and more. Update: WhatsApp can now be downloaded from Play Store. Play Store version now comes with these options. We haven’t come across a working method to hide your last seen time-stamp on a Windows phone. We did discover a spammy looking application which when we tried failed to work. So we didn’t consider mentioning them here. Update 1: WhatsApp for Windows may soon have an option to hide the last seen time. Thanks to the $19 billion deal between Facebook and WhatsApp! Same here. No working applications nor tricks to hide the last seen time. Unfortunately the WhatsApp teams developing apps for Windows & BlackBerry are slow. I hope after trying these tips out you’ll enjoy a fight-free life and people will no longer curse you simply because you don’t respond to their message even after you’ve seen them! Meanwhile I’ll try finding working method for Windows & BlackBerry. May be you’d like to check out the latest WhatsApp tricks!